The Charter Speed Test, officially called the Charter Communications Nationwide Speed Test, is an internet speed test provided, and recommended, by Charter, a major US ISP. Testing your internet connection with the Charter Speed Test is free and, while available to everyone, is probably best reserved for Charter customers (more on this at the bottom of the page). This is the same internet speed test for Spectrum and Time Warner Cable. Head to spectrum.com and wait for that to load. Tap or click on the GO button in the middle of the screen. Wait while both parts of the test complete. The whole process should take less than a minute. When it's all done, you'll see a summary screen, showing your download and upload bandwidth, along with graphical representations of your internet speed over the time it took to test. Below that, you'll see your IP address and ISP, plus the server used during the testing. If you plan on testing your Charter connection on a regular basis, logging each test somewhere is a smart idea, especially if you plan on making an argument to Charter about your too-slow high-speed connection. Like most internet speed tests out there, Charter's works by downloading and uploading specifically-sized pieces of data and logging how long that takes. Some simple math gets you those Mbps numbers that the test reports. 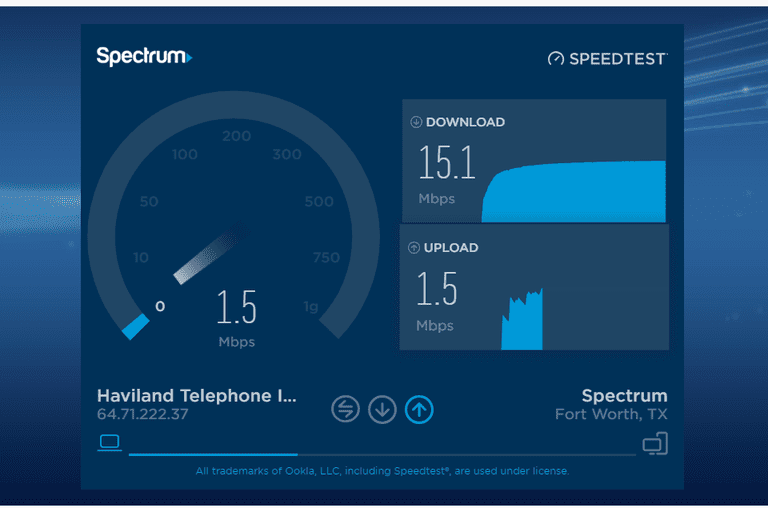 Charter's speed test uses OOKLA software, the same software that most ISPs use, as well as major test providers like Speedtest.net. The difference between a random OOKLA-powered test and the Charter Speed Test is that Charter's auto-connects to the closest test server hosted on Charter's network. In some ways that means the test isn't very accurate, but accuracy with internet speed tests is somewhat subjective anyway. If you're using the Charter Speed Test to see how well your connection between your home computer setup and Charter's servers that provide your internet service are, then this test is "accurate" for that. The internet is a complex network of servers, routers, and other devices. Every website or service you use online uses a different path from you to there and back again. How fast each path can move information depends on a lot of factors. See how to test your internet speed for help deciding what kind of speed test is best based on what you're after. Our five rules for a more accurate speed test should help you get more accurate numbers no matter what test you use. Some ISPs limit their speed tests to customers on their own network, but Charter doesn't do this, essentially offering a public speed test at their own cost. So, while you're certainly welcome to use Charter's speed test to benchmark your internet connection, it's probably less helpful than testing with your own ISP's speed test, but more helpful than a Flash-based testing site. Are Internet Connection Speed Tests Really Accurate?